Luxury vinyl tile (LVT) and luxury vinyl plank (LVP), also sometimes called resilient flooring, are perfect for active families with busy lifestyles who don’t want to sacrifice beauty in the design of their homes. At H & R Carpets and Flooring, we provide the Waunakee community with a variety of vinyl options to match every taste. 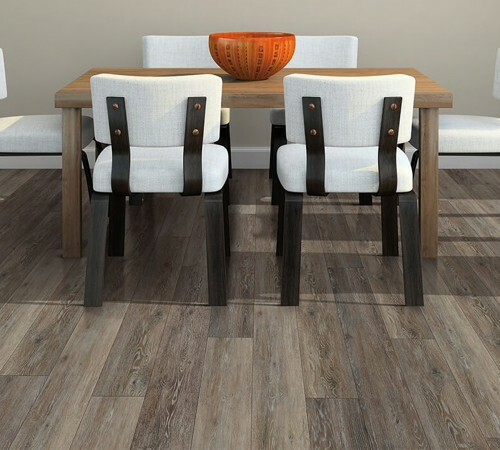 Discover the broad range of possibilities with luxury vinyl tile and plank flooring. Learn more about the installation process for your new luxury vinyl floor. Learn more about what it takes to keep your luxury vinyl floors looking their best! What is luxury vinyl and how is it made? Yet another form of vinyl is sheet vinyl, which is cushioned and gets adhered directly to your subflooring in one piece. You’ll find Shaw Floors sheet vinyl designs at H & R Carpets and Flooring that are as beautiful as our LVT and LVP styles, at an even more affordable cost. One thing to consider – the level of realism of LVT and LVP can’t be matched by sheet vinyl. If you have any questions about luxury vinyl, sheet vinyl, resilient flooring, or other related topics, we’re here to help! The team at H & R Carpets and Flooring is always ready to serve our community in Waunakee, WI and the surrounding area for all of its flooring needs.